Click here to get 2 tickets for $49 or call Texas Motor Speedway’s Ticket Office at (817) 215-8500 to see the historic Firestone Twin 275s and Ultimate Drifting presented by Scion and Motegi Racing. 04.20.2011–	New York – Scion unveiled the rear-wheel drive FR-S Concept sports coupe today at the 2011 New York International Auto Show. The concept, which sets out to stimulate the souls of true driving enthusiasts, will be at the Scion display through May 1. The FR-S Concept will inspire a new model coming to the Scion brand next year. 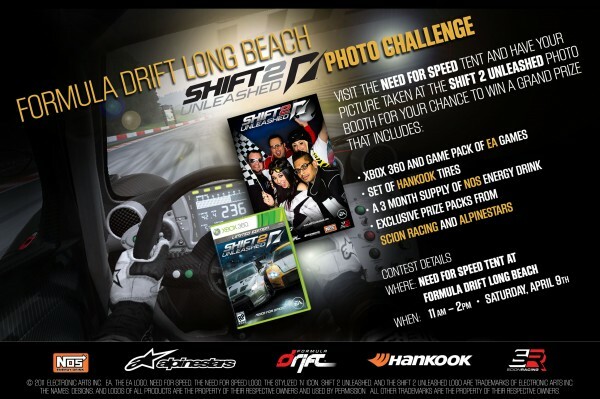 Take part in the Shift 2: Unleashed Photo Challenge at Formula Drift Long Beach this Saturday, April 9th. Visit the Shift 2: Unleashed photo booth at the Need for Speed tent for your chance to win a grand prize of an XBOX360 and 5 EA games, a set of Hankook tires, exclusive prize packages from Alpinestars and Scion Racing and a 3-month supply of NOS energy drink. Challenge runs from 10 am – 2 pm on Saturday, with grand prize winner announced at the Need for Speed booth at 2 pm.